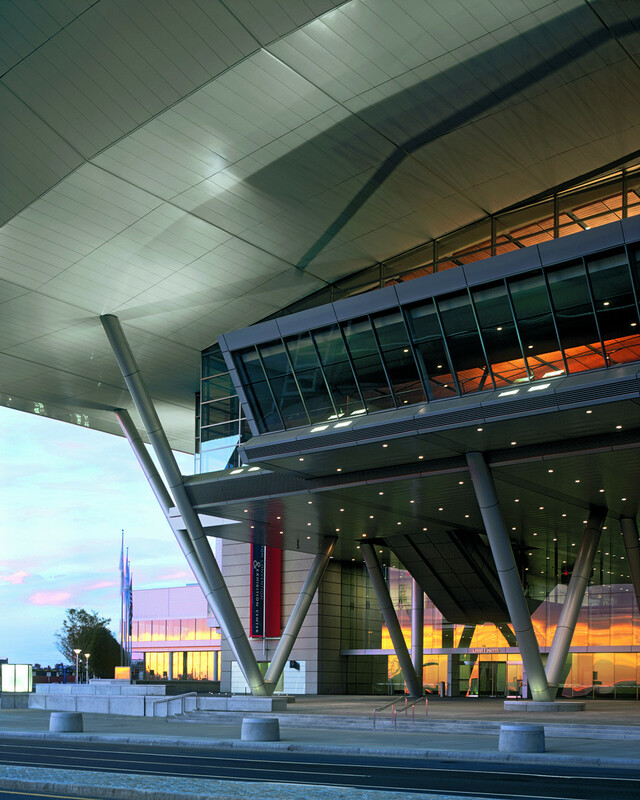 Rafael Viñoly and HNTB Architecture designed the Boston Convention and Exhibition Centre (BCEC), a steel and glass trade fair centre in Boston: a simple construction with a bold impact on the city. Boston has a new trade fair complex right in the city centre. Built on a long, narrow lot which is filled entirely to accommodate the great hall and all the related offices and service areas. The building has two big floors, one lower and one higher level, which may be viewed as the key to the entire project, rising up to a maximum height of 13.7mt (45 ft). The entrance to the exhibition centre has two tree-shaped pillars which give it a bold architectural character, as they are composed of inclined struts hinged to the earth and covered with aluminium. This structural type reappears throughout the lower level of the construction, while on the upper level, light, almost imperceptible piers with a circular base arise from the middle of the tripod bases. Despite their slenderness, the piers rise up to the springers of the big arched grids forming the roof, presented as structures which do not need a chain to absorb lateral thrust. In this way they manage to bring together all static flows along the slender vertical structures. Lastly, the astounding false ceiling in the entrance serves the function of improving the connection between panels of glass in the raised meeting room, which emerges generously out of the wall, but then disappears into the great hall. This design expedient uninhibitedly reveals all the building’s structural secrets, primarily simple profiles joined to a sandwich panel roof. All the installations practically disappear into the sides of the building, leaving the 600-metre-long central structure free, despite the 47,838 square metre surface area that needs to be climate-controlled.